Data from NASA's Chandra X-ray Observatory show new evidence of a "cannibal" star that recently devoured its companion star or planet, possibly also spawning a second generation of exoplanets in the process.The composite image on the left shows X-ray and optical data for BP Piscium (BP Psc), a more evolved version of our sun, located about 1,000 light-years from Earth. This story was updated at 2:37 p.m. EDT. Space can bea pretty rough place, and it just got rougher. A study has found evidence of a "cannibalstar" that recently devoured a companion star or planet, possibly spawninga second generation of exoplanets in the process. Data fromNASA's Chandra X-ray Observatory showed that the star, called BP Piscium (BPPsc), is a more-evolved version of our sun, but with a surrounding disk of dustand gas usually associated with young stars. Optical dataalso revealed a pair ofjets, several light-years long, extending from the poles of the star and shootingmaterial at high velocities out of the system in opposite directions. Thesejets, too, are typical of a very young star. Normally, ayoung star grows bigger as debris from the surrounding disk falls onto it. Thestar incorporates about 90 percent of the dusty, gaseous material and recyclesthe remainder through its jets. To explainthe presence of young-star features on the elderly star, scientists suggestedthat BP Psc appropriated the disk and jets from a younger neighbor that itgobbled up. "Itappears that BP Psc represents a star-eat-star universe, or maybe astar-eat-planet one," said the study's leader, Joel Kastner, a professorat the Rochester Institute of Technology. "Either way, it just shows it'snot always friendly out there." BP Psc islocated about 1,000 light-years from Earth, in the constellation Pisces. Thestar, including its disk and jets, is about two light-years wide. The disk andjets may disguise BP Psc's true age, but other characteristics of the star are giveaways.Most young stars form in clusters. BP Psc, by contrast, is isolated and notlocated near any star-forming cloud. Furthermore, its surface gravity appearsto be weaker than would be expected for a young star. And its atmospherecontains only a small amount of lithium, as do the atmospheres of most elderlystars. Chandra's X-ray eyes provided additional evidence. Young,low-mass stars are brighter than most other stars in the X-ray spectrum, and Chandra'sexamination of BP Psc revealed that its X-rays are too low to be from a youngstar. The detected X-ray emission rate is more consistent with those of rapidlyrotating giant stars.? "Itseems that BP Psc has been energized by its meal," said study co-author RodolfoMontez Jr., also from the Rochester Institute of Technology.? BP Psc isnot too different from what scientists expect of our sun toward the end of itslife. ?When the sun becomes a red giant star like BP Psc, it will swell so muchthat it may even consume Earth. "BP Pscshows us that stars like our sun may live quietly for billions of years, butwhen they go, they just might take a star or planet or two with them,"said study co-author David Rodriguez, from UCLA. At themoment, the researchers are unsure whether it was a companion star or a planetthat BP Psc gobbled. "It could bea small star or a large planet," Kastner said. "We don?t know which it couldbe, but we?re very interested in finding out." Even if BPPsc is killing off some of its planets, it also could be spawning replacements,evidence suggests. ?A second roundof exoplanets may be growing from the star's disk, hundreds of millions ofyears after the first round of planetary formation, scientists say. A separatestudy that used observations from NASA's Spitzer Space Telescope reports possible evidence of a giantplanet in BP Psc's orbiting disk. This could be either a newly formed planet orone that was part of the star's original planetary system. "Exactlyhow stars might engulf other stars or planets is a hot topic in astrophysicstoday," Kastner said. "We have many important details that we stillneed to work out, so objects like BP Psc are really exciting to find." 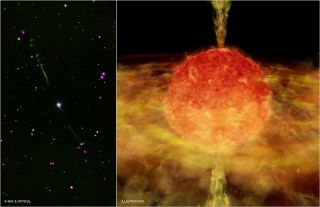 Studyingthese so-called cannibal stars could also aid the search for new planets beyondthe ones in our own solar system. "Inorder to understand the extrasolar planets that are now being discovered by thedozen, we need to figure out how planets might be forming, and therefore wherewe should go look for them," Kastner said. "I think this object isespecially interesting because it gives us a good shot at finding young planetsaround an old star." The resultsof the study are detailed in a recent issue of The Astrophysical JournalLetters.